Fiction Friday: Chapter 8 – The Bookshelf of Emily J.
Leda is tired. The lines on her face seem to be getting deeper, and sleep is becoming a hard-to-obtain luxury. She has no energy for cooking, no time for herself. Walt is recovering, something she isn’t quite sure of the meaning, and the nurse has been dismissed. Leda cares for her husband herself, helping him to the bathroom (an embarrassment for them both, although it is becoming more mundane, a surprise to Leda), lifting him out of bed (a maneuver her grandchildren find hard to believe that their grandmother can perform), and sometimes helping him spoon food into his mouth. Walt tries to do this all himself, often getting out of bed himself when she’s in the shower, Leda coming out of the steaming bathroom to find him on the floor, her dark yet graying hair still wet and plastered around her heart-shaped face. He thought this terribly funny, her finding him a few times a week sprawled next to the bed, like a beetle on its back, waiting for somebody to help. She’d tell him not to attempt to get up himself, not to try, but this isn’t in his personality. He must try. He must someday be able to walk again, to get up on his own, to be able to move about the house without sitting on his wife’s lap and being transferred to a wheel chair. That is the only way to live. He cannot fathom living without walking and moving on his own. Leda doesn’t find his falling out of bed amusing; she finds it terrifying. It reminds her of the hospital, when Walt was first admitted and had first woken up. When the nurses had forgotten to secure his bed railings, when he had fallen out of bed onto the cold, hard, tile floor. When Tim and Spencer had come to visit their grandfather, only to find him writhing in pain, the man in the next bed explaining that he’d been pushing the button for the nurse for a good ten minutes, yet nobody had responded. The boys had hoisted their sickly grandfather back into his bed, only to find that he still felt pain. His hip hurt, Walt complained. Leda arrived an hour later, flushed from the anxiety-ridden drive she’d completed from her home to the hospital, terror filling her heart because of the state she’d find her husband in and because of the traffic. She did not relish the thought of driving. She entered his room, finding Tim and Spencer telling jokes, trying to cheer the old man. She went to Walt’s side, asking him what happened. He’d fallen asleep, rolled over, and on out of the bed because the bed rails were not raised. The nurses had been negligent, this Leda knew immediately. Her daughter Diane arrived soon afterwards, her husband Joe in tow. They were indignant, demanding that the hospital be sued and punished. Leda didn’t want to sue. Vindictiveness was not in her nature, but she knew this wasn’t the right hospital for Walt any longer. The nurses came in to apologize, each blaming the other and then Mr. Simmons. He must’ve tried to get up, they sang, hoping Leda would believe them. She didn’t believe them. She knew Walt was the type of man who’d try to get up, when he actually could try, but right now, he couldn’t try. He wasn’t strong enough. He’d barely been in the hospital a week, barely learned that his right side had been paralyzed from the stroke, barely had time to take in what had happened. He didn’t have the time to think about getting up already. Days later, after Walt had kept complaining of his hip, to Leda, Joe, Diane, the grandchildren, and the hospital staff, he was finally given an x-ray. This revealed her husband to be a man with a broken hip, not just a whiner who’d fallen out of bed. The doctor profusely apologized upon making the discovery, seeing the tiny white line on the x-ray that indicated a crack in the bone. Surgery was scheduled for the next hour, making it so Walt would be in the hospital even longer with more painful symptoms. Why would he have done this to himself? Leda in the end did not sue, but transferred Walt to another hospital, a place more competent than Kaiser. They’d agreed to take the best care of him possible until this inevitable departure. What happened was a twenty-four-hour watch. Walt did not want to be watched, but that’s what happened. The school nurse turned out not to be as incompetent as the nurses at Walt’s hospital. Soledad remembers her leaving the house that day, her sweet perfume lingering in the air long after her departure, which ended with a promise for a visit from the principal. The next morning, as sure as the sun, Principal Vaun Pebworth met with Mama. Before his arrival, Mama adorned herself with her best dress, one that the late Manuel had bought for her long before his death. She walked around the house and picked at small crumbs, sweeping away any sign of dust, and smoothing her skirt in between ringing her hands. Mary kept comforting her, telling her that things would be fine. Soledad tried to cheer her mother by mentioning that since Mrs. Barton had been so nice, the principal was bound to be just as kind. Mama smiled at this childish reassurance, knowing it had no truth but hoping that it did. Pilar smiled sweetly at her black-haired, brown-eyed daughter, wanting to believe that in her five-year-old innocence there was some maturity, some wisdom of the world. Principal Pebworth arrives, immediately filling the tiny shack with laughter, handshakes, winks, and smiles. His joviality spreads to all of the Taranco family, including Mama. She quits ringing her hands and smoothing her skirt and talks with a happiness that her children do not recognize. Mr. Pebworth explains that he has made an appointment for her to meet with the Welfare Department. Mama interrupts, telling him with her small hands in the air that she’s already met with them, already asked for help, already humiliated herself. She does not want to pester them, to be a charity case or a burden. The principal explains that he will attend the appointment with the family, driving them there in his car, sitting in the lobby while Pilar applies. He will personally vouch for Pilar’s hard-working character, for her determination at keeping her family fed and warm. At his reassurance, she finally agrees that she can go. Her pride at being self-sustaining comes out, although she feels gratitude for Mr. Pebworth’s graciousness. She has no man to help her wade through this man’s world. Now, she has somebody to support her, even if it is just for a day. Pilar loads all of her children into Mr. Pebworth’s fancy blue car, with whitewall tires and a radio. Leda and Maria sit on their older sister’s laps to fit into the back seat of the Chevrolet. The radio blasts tunes the children have never heard, and they roll the windows up and down. Mama chides them for this behavior, for embarrassing her with their wild behavior and obvious enchantment with an object they don’t have and never will posses. 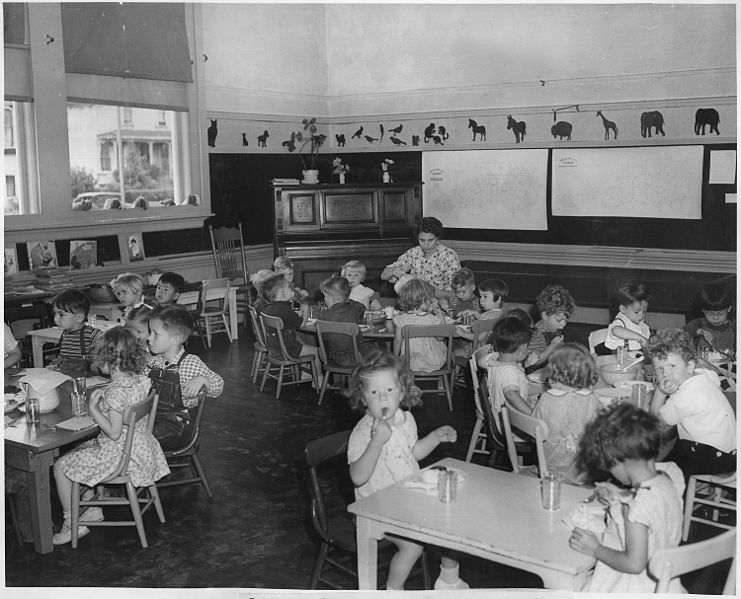 The children sit quietly as the welfare worker looks Pilar over with a critical eye and smiles at Mr. Pebworth. She examines the children, as if scientific experiments. After a long hour of tedious questions and sidelong glances, the worker stamps APPROVED in red letters on the application and gives Pilar a voucher for shoes. Mr. Pebworth drives the triumphant family home, promising that he’ll see them at school the next day. The siblings walked down dusty Crossman Road to find the Buster Brown store they had often admired from a distance. As they walked, they chattered and sang, sometimes linking arms or swinging their hands in time to the music they made. They reached the store in high spirits, with Pilar chiding them gently to behave themselves once inside. The store clerk watched them with suspicion clouding his view, but seemed relieved when Mama explained their purpose for coming and showed him her voucher. He knew he would receive payment for the shoes, eventually. Soledad picked out patent leather mary janes. She could see her reflection in their shine. She longed to don them the next morning, over her new socks, and head to school. The socks lacked lace, but the beauty of her shoes made up for that luxury, now almost forgotten in the face of so much increase. Josefa, Isabella, and Mary all picked saddle shoes, a thick brown stripe dividing the white heel and toe. They seemed to know that these shoes were fashionable, that their classmates would approve and allow them access to the social clubs already established. Soledad and Manuel remembered the view they had from the top of their pepper tree. They realized that now they were like everybody else, wearing shoes and socks. They slept well that night, knowing they had a passport of sorts to enter the society they longed to join. When they attended school the next morning, the other children stared. Soledad felt herself turning inward, hoping the others would stop looking in her direction. She knew her shoes showed a newness to be proud of, but she felt unsure of her hair and dress. The flour sack Mama had used to make the dress had been particularly pretty, with small blue and pink daisies dancing together in a mish mash of color, but Soledad knew it did not now compare to the dresses of the girls around her. Some wore lacy collars, as if framing their pink-hued faces as works of art. Others had fabrics Soledad had never seen before, but she knew they were pricey to obtain. This luxury surrounded her and she felt something she never had before: self-consciousness. The wide-hipped and plain-faced teacher began to call roll. Soledad watched as the other children lifted their hands in response to their names. She decided that she would do the same, except her hand-raising may be more meek than the others. She still did not want to call any extra attention to herself. The teacher’s voice, matronly and purely American, called out another name. Nobody responded to the question, causing everybody to glance around the classroom, wondering where the owner of the name could be. The teacher called it again, yet still nobody answered. As Soledad joined with the others in searching for a hand to claim that name, she realized with a fierce prickle of guilt in her heart that the name was hers, only pronounced with unrefined vowels. Again the teacher called “So-lee-dayd Tear-ahnce?” Soledad could not stand the awkward stilt of the classroom’s normally functional rhythm and slowly raised her hand. She just peeked her fingers over the desktop, hoping nobody would notice her, although she knew she must be noticed in order for the class to continue. The teacher noticed quickly, asking “So-lee-dayd” why she hadn’t answered the first three times she had called. Soledad explained that her name was not “So-lee-dayd” but Soledad, rolling the Spanish vowels around her tongue with ease. The other students and the teacher continued to be confused, not understanding how she had said her own name and wondering if they would ever be able to say it back. After a few more demonstrations, the business of roll-calling continued and Soledad’s name seemed to have been forgotten. During recess, two girls introduced themselves as Valerie and Audrey. They took Soledad under their wing, showing her how to skip rope and introducing her to other classmates. As they paraded the tiny play yard, a dirty boy with a snotty nose raced over to Soledad, pointed at her shoes, and called obnoxiously, “New shoes, new shoes!” Others in the school yard looked and laughed, some even joining in and pointing out her prized patent leather beauties. Soledad felt her face fill with the shame of being different. She had wanted to badly to fit in and knew that she did not, at least not yet. As she walked arm-in-arm with Valerie and Audrey back to their classroom, she dragged her steps, hoping to scrape her shoes and pick up some dust along the way. She realized then that being ordinary was all she wanted. When Mama came to collect her brood from their adventurous day at school, Soledad explained her desire. She told the story of the teacher who could not twist her mouth to fit Soledad’s name, the boy who rudely made fun of her (for what, Soledad did not reveal for fear it would hurt her mother too much after how far they had come), and the feeling Soledad had of being different. I always look forward to new chapters. Very captivating! The beginning of this story reminded me of my experiences caregiving for my mother when she was ill. Caregiving is such a difficult thing to do. While it ultimately made me stronger in some aspects, at the time it was so emotionally and mentally draining. Thanks. I have no idea if I’m accurately representing caregiving, but I’m trying!